I have a sweet tooth. Writing it here for this blog post, I'm not quite sure if I'm stating it as just another fun fact about me or if it is more of a confession about a dirty secret. I am slightly particular about what sweet products I consume, but it still doesn't change the fact that I have a weakness for delicious chocolates, baked goods, and a sugary drink from Starbucks. Thankfully, Milk + Sass has found a way to deliver "Candy for your hair", and that is something I DON'T have to feel guilty about! Stashed away in my recently discovered box of goodies from last summer's Cosmoprof North America was this adorable macaron-inspired hair brush. This little gem is about the size of my palm, and on one portion are radially placed plastic bristles while the other half contains a handy little mirror. The bristles are two different heights and spaced in such a manner to optimally detangle your hair without breakage. I really like the size of this brush! It fits comfortably in my hand and had no awkward handles when I use it to brush my hair. I've never been a fan of carrying a hairbrush in my purse as the handles always made them either difficult to get out with everything else surrounding it, or the handles would cause me to inadvertently pull out some purse contents in the process. I am certainly not ashamed of being a woman and having a period, but I would prefer to not advertise it to the world! The Macaron for Hair snaps closed and it an adorable addition to my handbag. As for the brushing aspect itself, I generally don't have issues with tangling so I cannot personally attest to how quickly it detangles hair. I can say, however, that this brush does nicely smooth out my hair and leaves me with a frizz-free finish. The only drawback to this brush, and what keeps me from turning it into a high-use product instead of the occasional use from my handbag, is the bristles are a little short for my hair. While the strands of my hair are actually relatively thin, the crown of my hair is very thick and full of hair. I cannot just stroke the brush down this area of my head and have the shorter bristles fully reach the depth of my hair. I'm able to make it work by partitioning my hair into sections although I do wish the bristles were longer in general. 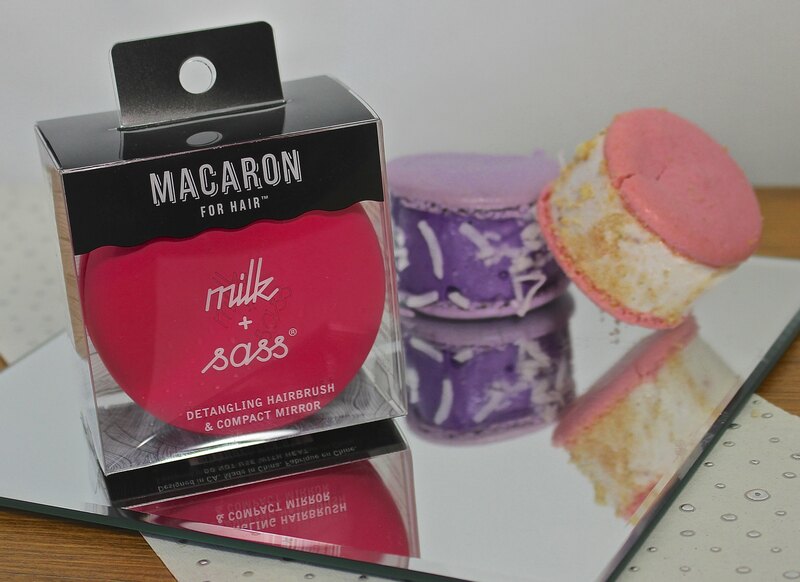 The Milk + Sass Macaron for Hair can be purchased at the Milk + Sass website located here. It is available in assorted colours, not just the raspberry here, and retails for $12.99. If you want to splurge a little, they have a shiny gold option available for purchase for $15. You can also get free shipping with orders over $25 with the code SASSYHAIR; why not pick up an extra for your bestie or pick up some of their Sugar Twists, their fantastic spiral shaped plastic hair ties! 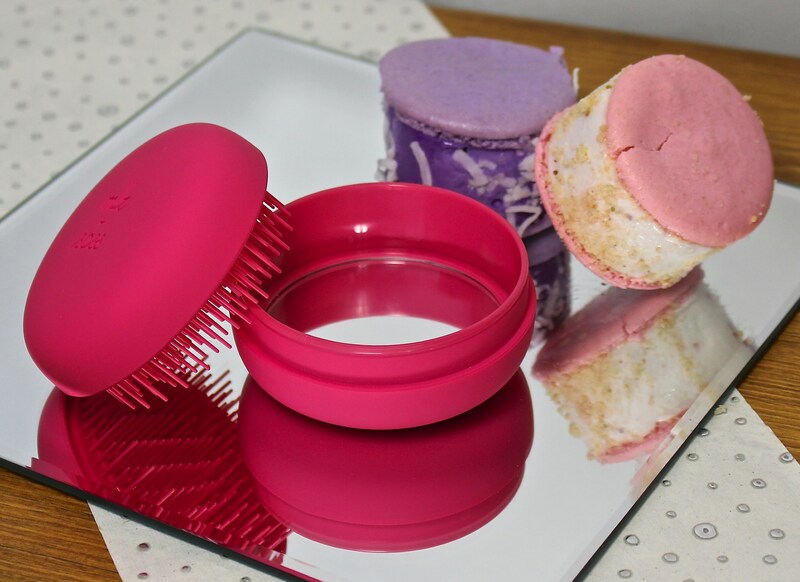 Do you keep a brush in your purse or gym bag, and is it as cute as the Macaron for Hair? Do you have friends that would love one of these? I'd love to hear from you! I wish I had something small like this for my gym bag. It looks really handy! I feel like this would just make me want a macaron every time I saw it! Great size for my purse! My hubs and I are taking a macaron making class in 2 weeks! :) I can't wait! I have two of these and I love them. One is in the shower since my husband always likes to use a shampoo brush and the other in my purse. It's a much cleaner way of keeping a purse brush plus they are so cute. 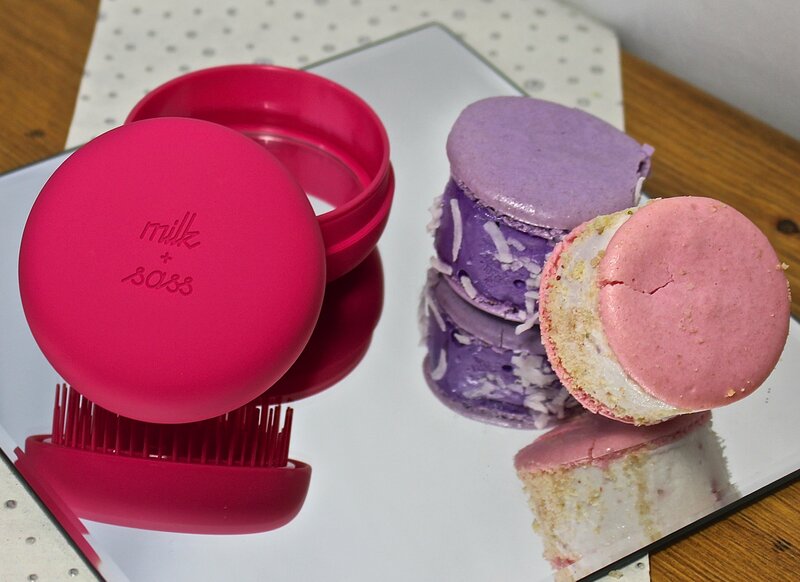 The Milk and Sass hair macaron! OF COURSE!! I saw your Instagram teaser yesterday and I just could not figure out what your post was going to be about. 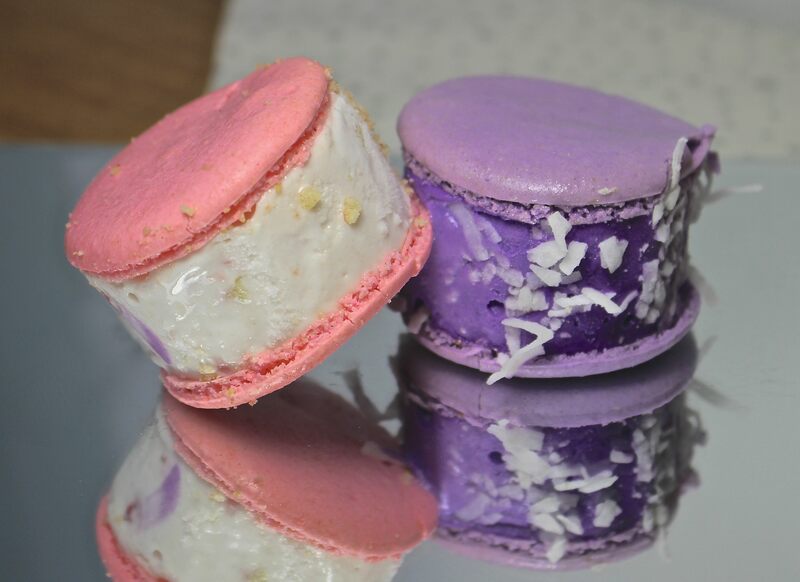 I could totally go for a tasty macaron right now haha! I have the milk and sass for hair! It's cute. They look just like real little macarons! I have a mini wet brush I keep in my purse but it's not this cute! This is really cute, though it would get lost in my tangled mop! I've never kept a brush in my purse because like you mentioned they are awkward to remove and get caught on things. This probably isn't the one for me since I have very thick hair and would need longer bristles but my daughter would love one for herself. Cute and YUM, this totally makes me want something sweet! This is cute! Perfect for in your bag. Oh my gosh that's the cutest little brush!! Your post is making me hungry for macaroons.